The Rt. Hon. 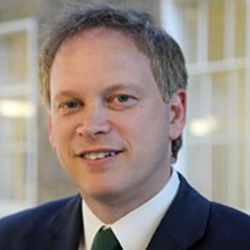 Grant Shapps was appointed as Minister of State at the UK Department for International Development on 11 May 2015. He was elected at the Conservative MP for Welwyn Hatfield in 2005. He was appointed Vice Chairman of the Conservative Party in 2005, before being made Shadow Housing Minister in June 2007. Following the 2010 UK election, he served as Minister of State for Housing and Local Government in the Department for Communities and Local Government. He was also appointed to the Privy Council in June 2010. In September 2012 he was appointed as co-chairman to the Conservative Party. At the same time he held the position of Minister without Portfolio at the Cabinet Office.